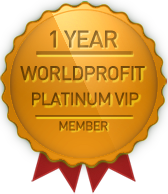 Worldprofit's Silver and Platinum VIP Members are business owners who hail from all over the world, from all walks of life. They share something important though, character qualities found in every successful person - the willingness to learn, the desire to achieve a goal, and the focus and determination to make it happen. We asked Rheal to share his experiences and how Worldprofit has helped him grow his own successful online business..
Rheal, can you share a little information with us about you? I am a Canadian and been working the internet starting back about 2005. I am married with two daughters, I worked in the field of construction as Civil Superintendent. I was always interested in working the internet but things were hard back then because I did not have much time. Road construction required long hours and being away from home. I was a Worldprofit member way back then but did not understand the internet so started trying different sites. I had some other sites that really made some great promises only to find out they would fade out or just outright not pay me. When I worked as a Superintendent part of my job was to meet people and have site meetings to explain the project. So I was always looking for a way to create a pension to help me when I retired. I was kind of forced into retirement with cancer treatment, now recovering I decided to spend and dedicate my time with Worldprofit. After being on the internet so long I believe truly that Worldprofit can help me reach my goal of retirement. Rheal, what was the reason for your initial interest in Worldprofit? Rheal, can you share some of the reasons that you continue as a loyal Member of Worldprofit? What keeps me attracted to Worldprofit is simple - it works! You get results and one thing is support it's awesome! If I have a problem they are there to help even create a video to explain and demonstrate how to do it. One important factor is the Friday webinars if anybody does not understand something all you have to do is ask and help is there. Rheal, do you have any words of advice for someone looking for an online business or considering joining Worldprofit? The most important thing I tell a new member is to treat this site like a real business, not a get rich quick site or just a hobby. If they are serious about succeeding take the Silver Membership for one year if they can afford it they save 60% and not have to worry about payment and concentrate on learning and promoting their site. Rheal, you are a Monitor who volunteers your time to help others in Worldprofit's home business community. Can you offer some reasons why you enjoy being a Monitor? I believe everyone should experience becoming a volunteer you meet all kind of people. I enjoy this, just being able to help people reach the goals some for the first time. Also I get perks for making sales for other Members. I love explaining how easy they can become part of something that can really change their future. Rheal, what are some of tools and resources in your Worldprofit Membership you find most helpful in growing your own online business? I like to use my Diamond rotator advertising, I set it up and forget about it then let it do its job. Tools that help grow my traffic are the traffic blaster, and the affiliate link blaster. Probably the most important tool on this site is Worldprofit's training, especially your lesson 3. When you are done with lesson 3 go back and make sure you are actually doing what it says in the lesson to get results. You can eat an elephant one bite at the time don't try and swallow the whole thing at once. - Get a free 15 minute consult from Rheal. Ready to start your own online business? One of the best ways to achieve your goals is find someone who's doing what you want then follow in their footsteps. We've got everything you need to get you started - website, traffic, training and importantly HELP without the HYPE.